If you do not know about the revolution that CRISPR has ignited, you should. CRISPR (Clustered Regularly Interspaced Short Palindromic Repeats) is a relatively recent discovery in the history of biotechnology. But, not since the atomic bomb has a technology so alarmed its inventors that they warned the world about its use. Biologist Jennifer Doudna called for a worldwide moratorium on the use of the new gene-editing tool CRISPR — the technology that she helped create — to make heritable changes in human embryos. The cheapest, simplest, most effective way of manipulating DNA ever known, CRISPR may well give us the cure to HIV, genetic diseases, and some cancers, and will help address the world’s hunger crisis. Yet even the tiniest changes to DNA could have myriad unforeseeable consequences — to say nothing of the ethical and societal repercussions of intentionally mutating embryos to create “better” humans. The simplest explanation is that CRISPR is a tool that enables scientists to target a specific area of a gene, working like the search-and-replace function in Microsoft Word, to remove a section and insert the “correct” sequence. Genome editing involves the deletion, insertion, or modification of the genome at a specific site in a DNA sequence. For many years, researchers had been trying to develop easy and cost-efficient genome editing tools to address problems across a wide spectrum of fields. Finally, the efforts of researchers paid off with the development of CRISPR, a robust molecular tool that can edit DNA at virtually any location. CRISPR technology is igniting a revolution across the life sciences and is quickly becoming a standard tool in many labs. Given its ease-of-use and versatility, CRISPR is already used for a variety of applications and holds a lot of promise for the future. Once scientists figured out the mechanism of CRISPR, it did not take long for them to realize the potential for engineering the genomes of microbes, plants, and animals. Today, CRISPR is utilized for a variety of applications. CRISPR is not only paving the way for researchers to solve the most difficult of problems in the life sciences, but it is also enabling the scientific community to explore dimensions of the genome that we’ve been unable to study up until this point. Due to its adaptability across a wide range of species and its simplicity of use, CRISPR has quickly revolutionized genome engineering. 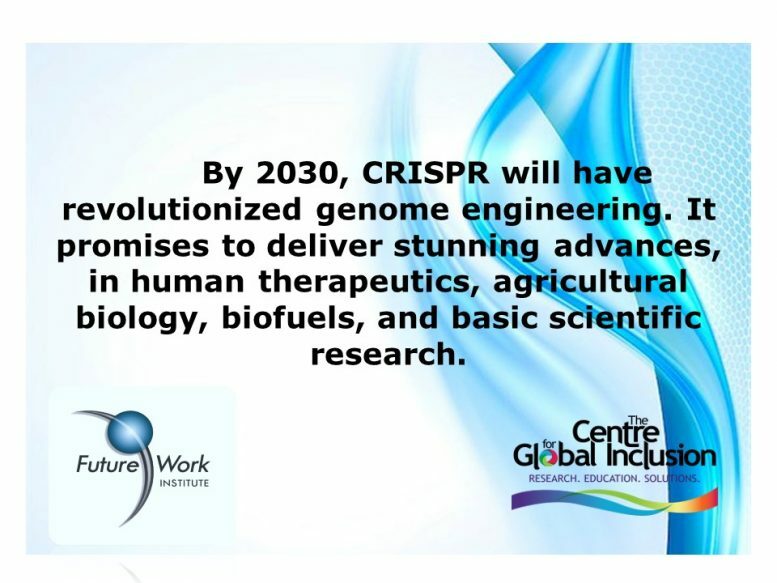 CRISPR technology promises to deliver some truly stunning advances within the coming decades, particularly in relation to human therapeutics, agricultural biology, biofuels, and basic scientific research. Among other things, it has been used in experiments to make mosquitoes resistant to malaria, genetically modify plants to be resistant to disease, explore the possibility of engineered pets and livestock, and potentially treat some human diseases (including HIV, hemophilia and leukemia). The potential for CRISPR research to improve human medicine would be hard to overstate. The technology has already transformed cancer research by making it easier to engineer tumor cells in the laboratory, then test various drugs to see which can stop them from growing. Soon doctors may be able to use CRISPR to treat some diseases directly. But there are real limits to what CRISPR can do, at least right now. Scientists have recently learned that the approach to gene editing can inadvertently wipe out and rearrange large swaths of DNA in ways that may imperil human health. That follows recent studies showing that CRISPR-edited cells can inadvertently trigger cancer. Reports of successful genetic modification of human embryos also raise questions about how we should react. No scientific discovery of the past century holds more promise—or raises more troubling ethical questions. Most provocatively, if CRISPR were used to edit a human embryo’s germ line—cells that contain genetic material that can be inherited by the next generation—either to correct a genetic flaw or to enhance a desired trait, the change would then pass to that person’s children, and their children, in perpetuity. The full implications of changes that profound are difficult, if not impossible, to foresee. The challenge: it is easy to use and easy to misuse. It shows great promise and raises troubling ethical questions, which may be answered differently in different cultures. But, we need to understand the issues, even if we do not fully understand the scientific explanations. To help with that process, here are two simple guides.